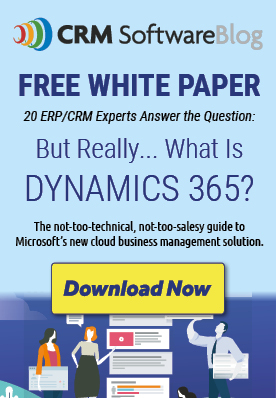 Is Dynamics CRM 2011 Really Better Than Salesforce.com? Is Microsoft Dynamics CRM 2011 Better Than Salesforce.com? I’ve been seeing quite a bit of hash-slinging between the two major players in the CRM market – Microsoft Dynamics CRM and Salesforce.com. With the release of Dynamics CRM 2011, Microsoft has positioned itself in direct competition with salesforce.com. An article from www.cloudcomputing.internet.com included a comment accusing Microsoft of releasing “…inferior product, with no innovation, resorted to competing on price…” I’m paraphrasing Scott Holden, Salesforce senior director of product marketing. And you know what? Up to now, I would have agreed with them. (My boss is probably shaking his head right now). But I believe that these conversations we’re having in the blogosphere are supposed to be real – and honest. So here it is folks. Microsoft hasn’t always been an innovator, it’s true. They’ve come along after the fact and thrown a ton of money at catching up to what the market wants. Some good things came out of it, some not-so-good (think Windows Vista). However, CRM 2011 is truly something that I can wholeheartedly recommend to my clients, friends, family; something that I’m using earlier than any other software release in my 15-year career. Why? Microsoft, although maybe a bit late to the party, has listened to their users and tailored the product to do what it should have done a long time ago. And they made it easy. So even if you ignore the cost-savings, and the commitment to R&D, and the fact that Microsoft is probably going to be around for a good long time supporting CRM, you are still looking at a sleek, powerful, simple-to-use CRM system. The one-page wonderful web-page-type feel of the screens. I just love it. Dashboards. Out of the box. Simple, simple, simple importing, escalating, and appending. Extensibility – even for someone who isn’t a developer or code-junkie. Total record count from advanced finds/searches. Audit trails – who last edited, entered information here. Custom activities – no longer are we tied to what someone else thinks we do all day. Field level security – I can’t tell you how many of my clients have wanted this. Now they have it. Not to mention that you have your choice of on-premise or fully hosted, or any combination. So I don’t have to have Exchange servers and climate control and redundant systems, freeing me up to worry about the ten thousand other things that I need to get to! If you’ve already invested in Dynamics CRM, you’re going to love the new features. If you’re still making your decision, definitely review your options. There’s a lot out there, and salesforce.com is worth reviewing. However, I know if I were choosing today, I would choose Dynamics CRM, and I wouldn’t have said that a year ago. Feel free to contact me with any questions you may have: Donna Krizik, Feterick & Associates, Inc 847-795-8200 x202 or [email protected]. Submitted by Feterick & Associates, Inc –Microsoft Dynamics CRM Partner in Illinois. Basically, both CRM tools are pretty good. However, I prefer web-based solutions as it gives efficiency and agility to compete in the market. Lately, my business partner recommended http://www.workforcetrack.com and it is quite well online ERP solution provider. What I like it most is that you can sign up for a free trial account and use the program for a week. If you like it, then you can buy your own.